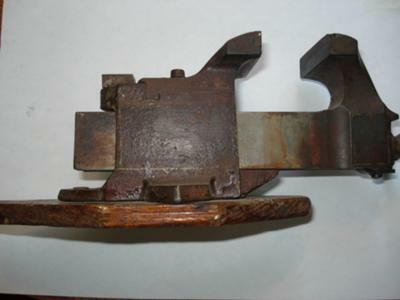 Your vise looks to have been manufactured by Prentiss, a vise maker from NY. It's classified as a jewelers vise but was used by anyone needing to hold small work. The pin located just behind the rear jaw is removable and allows the rear jaw to swivel and hold work that does not have parallel edges, for example, a wedge shape. The number 82 is an assembly number and will also be found on the rear portion of the vise, under the rear swivel jaw. The wood was added by the owner and was not sold with the vise. Join in and write your own page! It's easy to do. How? Simply click here to return to Antique Woodworking Tool Photos. Free Rockler Woodworking Catalog Here. Copyright © 2011 EdMedia. All rights reserved.